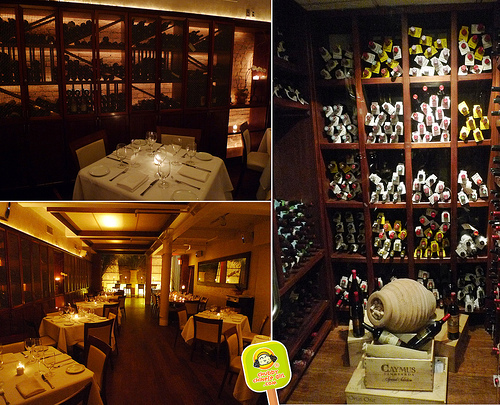 A couple Tuesdays ago, I was invited to a press dinner at Thalassa. If you’ve seen my list of restaurants, you’d notice Greek and Mediterranean is somewhat absent, so I welcomed the invitation with an open tummy. I wasn’t expecting such a beautiful, open, airy, elegant yet comfy space.The bi-level high ceiling feel is a pleasant change from small cramped restaurants I’ve been visiting lately. 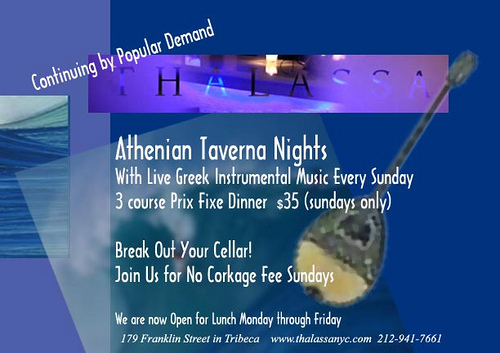 Plus on Wednesday nights they have live Greek jazz guitarist. Pampering all our senses. 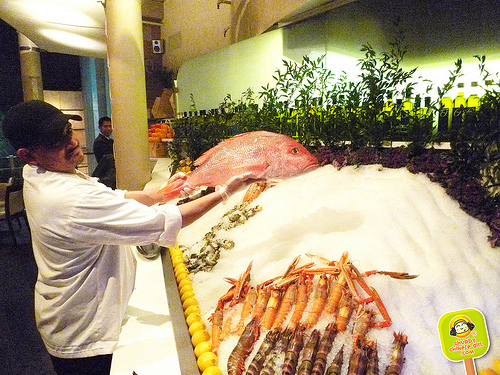 Walking to the main dining room, we pass a cornucopia of fruits from the sea. I knew a good meal was heading my way. They import their seafood directly from Greece, Spain, Portugal and Hawaii. 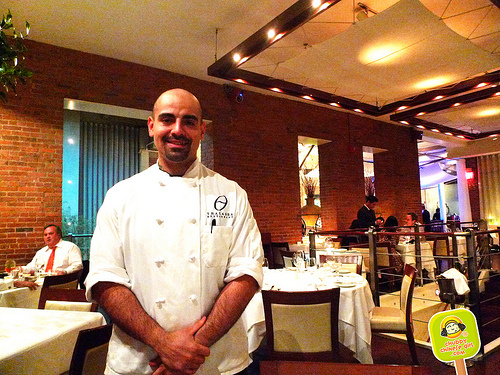 Executive Chef Rafael is a friendly and passionate foodie, who loves to try new things and put twists on classics. Greets us with smile, the promise of great dishes was in he air. I was ready! 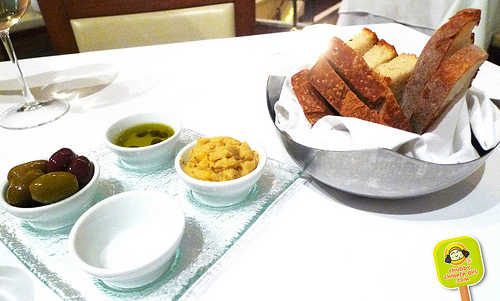 Along with bread, there’s juicy olives, fava bean spread, olive oil and salt. Life would be ok with this alone. But I had to take it easy… tastier things coming. 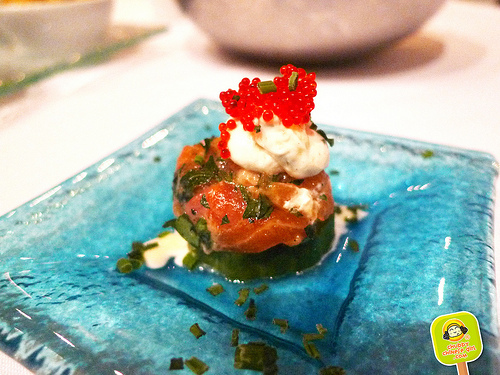 My “bouche” was “amused” by a classic Salmon Tartare sitting on cucumber. 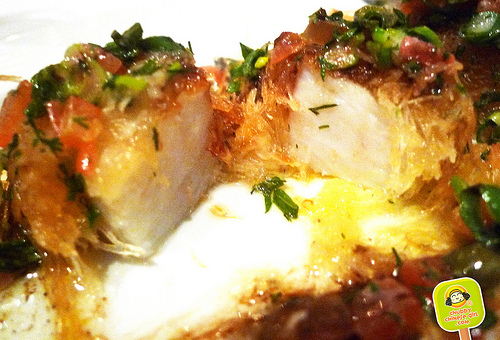 MAINE DIVER SEA SCALLOPS turns out to be the best appetizer to be shared. 4 whole ones in an order, its rich enough to split. 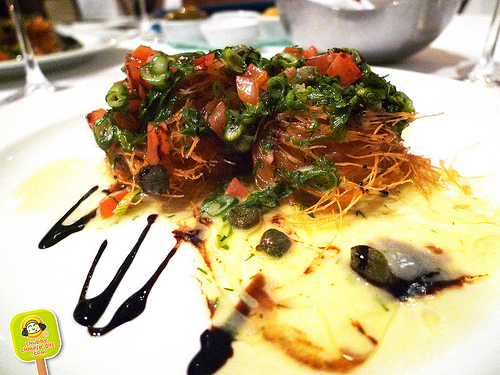 Sweet scallop is wrapped with a crunchy kataifi filo, bathing in sheep’s milk butter with a drizzle of kalamata balsamic reduction. All the richness is contracted by a fresh herb and tomato garden on top. It hits my palate with a kiss and I smiled. As buttery and rich as it was, I kept wanting more. This alone could of been my meal, but my feast was just starting. TARTARE TRIO came beautifully. 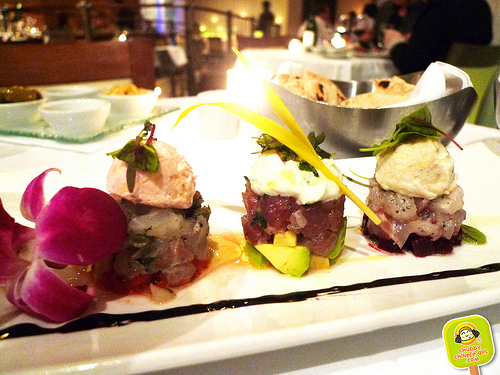 Royal Dorado with a light red pepper base, Tuna and advocado and Lavraki (European sea bass) with taramosalata. 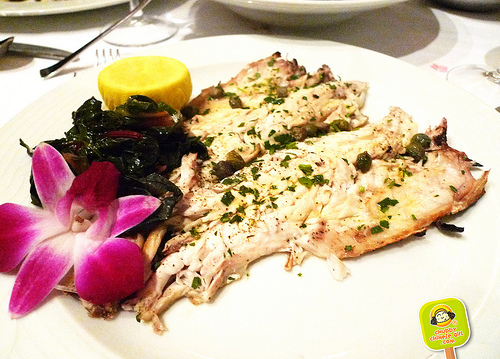 The freshness of the fish was accompanied by a light hint of truffle oil. 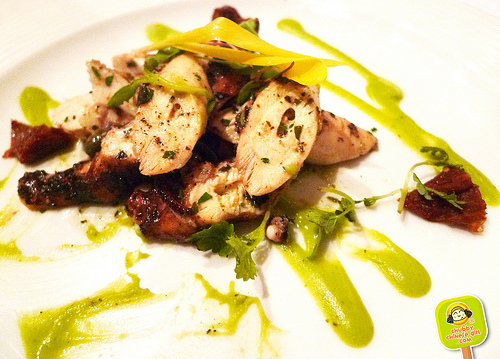 OCTAPODI is their grilled Portugal Octopus with red wine vinaigrette. I loved the smoky flavors dancing in my mouth while my teeth sank into the meatiness of the octopus. A little tartness brought it all together. One of the great octopus dishes I’ve had, not the best, but up there. We curiously asked the Chef how he was able to make the octopus so tender, he generously revealed his very creative secret, but unfortunately, I have to keep it that way. Just know that its a solid dish and one I will go back for. The yummy final result is what’s important to me anyways. LAVRAKI is flown in from Greece. The mild fish is prepared simply. Olive oil, butter, lemon and capers. Sometimes, simple is best, specially in this case. Tender and moist, it soaks up flavors well, while still keeping its natural aroma and sweetness. Perfectly crisp edges and skin. Dessert is always welcomed by my sweet tooth and the folks at Thalassa were more than generous. 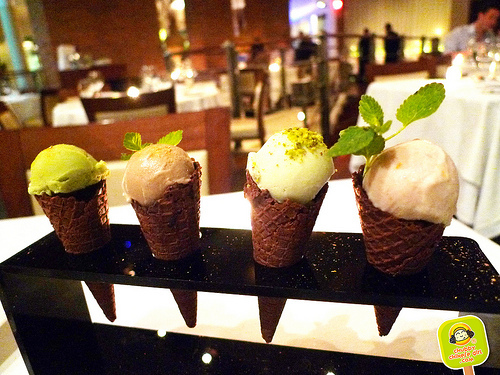 We started off with THALASSA’S ICE CREAM MEDLEY in Green Tea, Greek Coffee, Baklava and Rose Petal. My favorite was the creamy baklava flavor, part sweet honey part pistachioy, the rose petal left a lingering aroma which was very playful and girly as well. The presentation is super cute and mini. If you’re on a date, I’m pretty sure the chick will go “awwww” (if that’s what you’re looking for of course hahaha). I dig cute and mini things, so this was right up my alley. 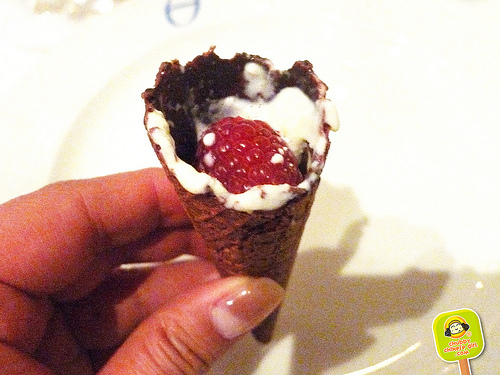 The chocolate covered cones were a nice touch and I was “berry” surprised with the center. HALVA WITH ALMOND & RAISINS has a soft, dense bread pudding like texture. The dab of yogurt on top breaks the sweetness and the pool of warm pumpkin sauce with cinnamon takes me to fall. 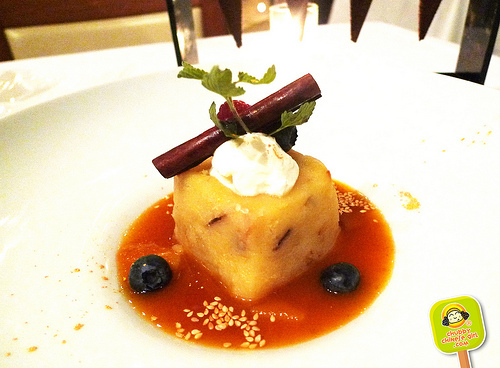 MASTIHA PANNA COTTA is made with the Greek specialty liquor Mashiha. I liked a hint of it in the panna cotta, which was as smooth as it can be. But when they poured me the drink itself, lets just say, I wanted to get home safely and stopped after a few sips. By this time, I was uberly stuffed in a good way of course. A job of a food blogger is tough as you can see. Overall I had a great meal and will return another time to try some other dishes. This might be a more modern twist to what you would eat in Greece, but solid flavors and fresh ingredients were present in every bite. I went here many many years ago and really enjoyed it. It's good to read that they're still dishing out good food. Yeah it was really good and I can't wait to go back! The space looks huge and the food looks amazing! The Octapodi and trio tartare looks fantastic!